Research has revealed that wearing flight socks can reduce the chances of deep vein thrombosis by more than 90%. 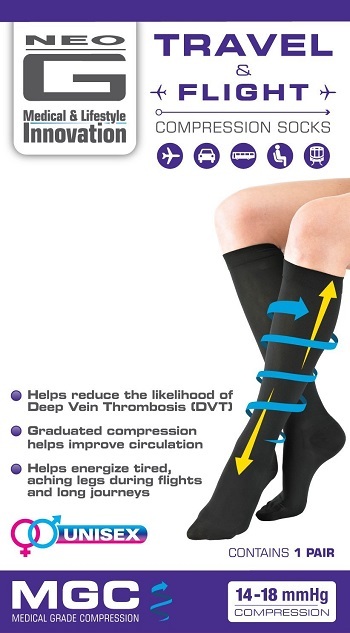 Airline passengers can anticipate a considerable reduction in the risk of DVT if they wear compression socks. To ease your search, we sampled the best flight socks to encourage healthy blood flow and prevent clotting. Designed primarily to help improve circulation on long journeys, the Neo G travel & flight compression socks feature a shaped heel cup for perfect positioning, top band for comfortable fit and reinforced toe for durability and comfort. The socks have a graduated compression of 14-18mmHg with maximum firmness at the ankle that decreases gradually up the leg. They are unisex and discreet and are ideal for all types of travel. With cotton-rich anti-DVT flight socks, you are assured of firm 10mmHG ankle support and graduated compression throughout. Each pair is made of 68% cotton for comfort with 29% nylon and 3% elastane for support. It is available in a variety of sizes and can be worn by anyone regardless of gender and age. Additionally, they conform to British quality standards and are ideal for all types of long distance travel. These socks are medically proven to help prevent DVT by helping to improve circulation. Primarily made from fibre content, they are ultra-soft and have a comfort top. Beyond the sorts, they look and feel like regular socks. Moreover, they have antimicrobial protection to keep your feet fresh and odour free throughout the journey. Their compression level is 14-17 mmHg graduated all the way up to the knee. Scholl Flight socks are recognised by ABTA and approved by Aviation Health Institute. Deep vein thrombosis is a blood clot that forms in a deep vein located within the body. A blood clot is a small mass of blood that in solid state. Blood clots typically form in your thigh or leg, but they can also develop in other parts of your body. DVT occurs most commonly in people over 40 years of age. Certain conditions that alter the movement of blood through the veins can also increase your risk of developing clots. They include history of DVT, recent surgery, cancer, stroke, being overweight, having an injury or smoking. What is travel-related deep vein thrombosis? If you are travelling to long distance places by plane, car or bus, you are at a slightly higher risk of developing DVT. This is due to long hours of sitting immobile and cramped. Blood flows slowly and may collect in the legs as they are hanging down. As such, clot formation is more likely to happen. What are the symptoms of DVT? Pain, swelling and tenderness in the affected leg. Rarely, you may experience swelling in both legs. Severe cramping that usually begins at the calf of the affected leg. Skin over the affected area gets warmer than the surrounding skin. Skin over the affected area turns pale or bluish in colour. DVT may at times occur without any noticeable symptoms. However, common warning signs include sudden shortness of breath, light-headedness and rapid pulse. If you think you are at a slightly high risk of developing DVT, consult your GP before travel. Your doctor might prescribe medications that will thin your blood and make it harder for clots to form. Likewise, wearing compression socks applies gentle pressure to the ankle and boosts blood flow. It’s, however, important that compression socks be measured beforehand. They come in a variety of sizes and have different levels of compression. For instance, class 1 socks with a pressure between 14-17mmHG are generally sufficient. Wearing ill-fitting socks could increase the risk of DVT. Seek advice on fitting from a healthcare professional. Make sure you have enough room in front of you for your legs to move. Every hour or so, bend and stretch your legs when seated. Take a walk up and down whenever you can. Consider wearing flight socks or a foot hammock if you have space. Avoid taking alcohol and sleeping pills. Note: It is recommended that you seek medical advice before getting yourself compression socks if you have any of the the aforementioned medical conditions. Swollen Ankles After Flying: To Worry Or Not To Worry? Stella is a senior editor at Pedi Reviews. She began her career doing social marketing in the telecom industry but soon realised she wanted to start publishing independently. She loves a good pedicure and a glass of good wine. For a little while, getting this vein thing was one of the reasons I was scared to go on an airplane. Even with the socks I am still not sure that I would get onto a long plane ride.